Mes Aynak, once a central location on the Silk Road, is now one of the greatest archaeological wonders of the world. With artifacts discovered from China, India, and Iran, the site’s preservation is unlike any other. 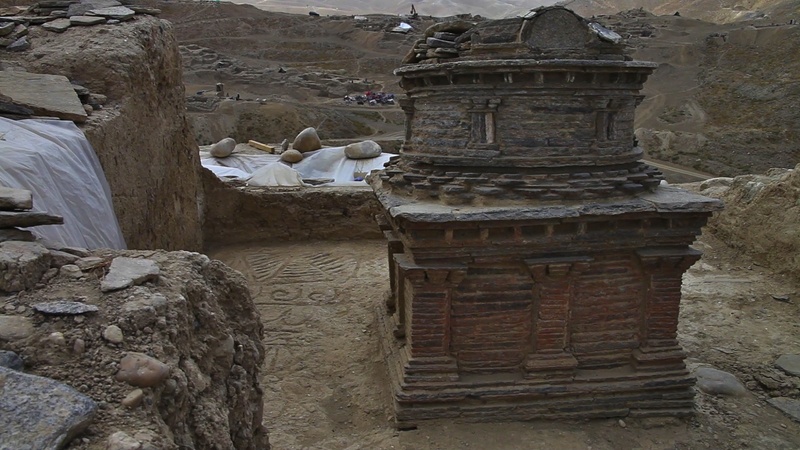 What lies beneath its ancient ruins has the potential to change not only Buddhism but also Afghanistan’s place in the history and culture of the world. Following the efforts of Qadir Temori and a team of archeologists, Saving Mes Aynak brings attention to their struggle to protect and save the site in the face of seemingly insurmountable odds. What should be a 20 year project is under threat by the Chinese company MCC whose plans to destroy the site and build a copper mine could happen at any minute. Faced with corruption from Afghanistan’s government, the threat of the Taliban, an uncooperative U.S. Embassy, and the impending Chinese pollution that will make the surrounding areas unlivable, Qadir and his team do the only thing they can. They keep digging into the past and hope for the future. I was given the opportunity to speak to film’s director/writer/cinematographer and editor, Brent E. Huffman, about what’s at stake at Mes Aynak, his surprising experiences during filming, the dangers he and the archeologists faced, and why U.S. media hasn’t given more attention to this situation. His story is one of passion, perseverance, and a deep respect and admiration for a people whose cultural history could be wiped away unless something is done to change that. Richard Newby (Audiences Everywhere): You’re from Medina, Ohio. I’m actually from Columbus. So I’m curious, how did you get interested and involved in documentary filmmaking growing up in Ohio? Brent E. Huffman: That a great question! I was always interested in anthropology. In high school I got really interested in painting and visual art and I think documentary kind of combines all of my interests in one place which was really appealing. I grew up in sort of a poor farming community, so to be able to travel and embed myself in different experiences has always been extremely appealing to me. Being kind of isolated, I grew up never traveling and fantasizing about National Geographic photographers and the adventures they were having and the things they were doing was always the kind of life I wanted to have. AE: Did you have any archaeological background before you started filming that prepared you for what you saw in Afghanistan? Brent: In college I took one archaeology class and I was part of a dig in Ohio actually, but other than that, no I was completely new to it. And I think the type of rescue archaeology that was being performed in Mes Aynak was, and partly because it’s Afghanistan, was very surprising and not normal. It was under extreme circumstances just in terms of extremely limited equipment. You saw in the film, the archaeologists don’t have one computer; they don’t have one camera. I mean it was jaw-dropping to see people try to do professional work in that situation. 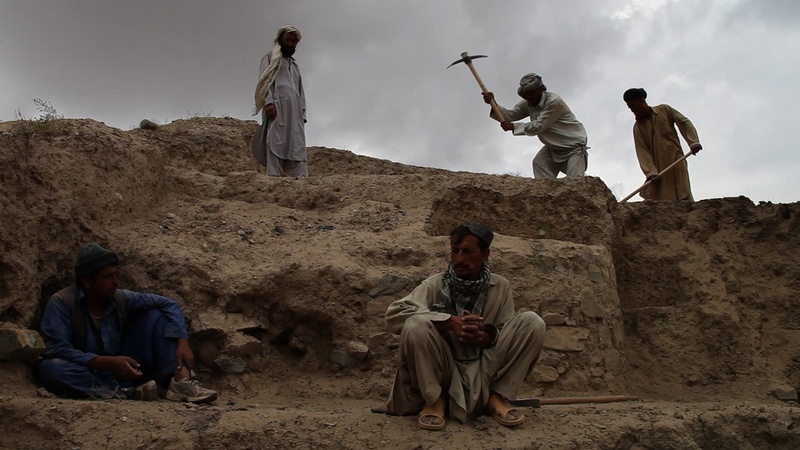 Afghanistan is the most land mined country in the world, so they’re digging in the mountainside where there’s landmines all over and they’re being threatened by the Taliban, and they’re given these extreme time limits; they’re not being paid regularly. AE: Could you touch on rescue archaeology a little more? Brent: Rescue Archaeology doesn’t entirely get explained in the film, but it’s almost identical to what a looter would do in some situations. Archaeologists know there’s got to be something inside this temple, and they’re thinking, ‘well it’s just going to get destroyed anyway,’ so they’ll dig inside it and destroy the [temple] to see what’s there. These are the kinds of things that would never happen in a normal excavation project. AE: What was it that led you to explore Mes Aynak specifically? Brent: My wife is Chinese and I became really fascinated with China in grad school and I lived in China for a while and I was really interested in China internally and more recently China’s external push into the world. I made a film about China in Africa. I’m working on a film about China in Pakistan right now. Initially I was really interested in China and this government owned Chinese company setting up in a Taliban country in Afghanistan and importing its own workers to live out in the middle of nowhere in this dangerous location. In 2010, there was this New York Times story that said the U.S. military was actually protecting this Chinese company and helping them set up which really struck me as completely bizarre. I couldn’t wrap my head around it. AE: Yeah, it’s just insane. Brent: It is. And then it was later that I discovered that on top of that there’s this enormous ancient city that’s going to be completely destroyed. Over 5,000 years of history that’s going to be destroyed to make room for a copper mine. The layers of the story as I was unraveling them became more and more unbelievable and interesting. It felt like an impossible story, and when I watch the film, it feels like a film that shouldn’t exist because nobody wanted to be on camera to talk about this. To access the site was very difficult, very dangerous. There were just so many roadblocks in making the film. I’ve made a lot of enemies. There’s a lot of people that hate this film. It’s been a difficult process but one I think I would’ve never given up on. AE: What is it about the film that people hate? Brent: I started the film in 2011, and it seemed like the Chinese company and the Afghan government thought no one would care about this. They thought people would think it’s a bunch of old dusty statues that nobody cares about. And everyone wants Afghanistan to be economically successful and resource extraction seems to a lot of people like the miracle answer to all these problems. So I became a problem by documenting what was being found and telling the story. AE: Is Afghanistan just as responsible for the destruction of Mes Aynak and the surrounding area as the Chinese Company? Brent: The Afghan government is responsible, and they’re the ones who are going to let this terrible thing happen. The entire environment of this area is going to be completely devastated. The mine will pollute into river systems and effect Kabul and even run into Pakistan. This area will be polluted forever and no one can ever live there again. And with the level of corruption in Afghanistan, the Chinese companies are not going to hire Afghan workers for anything but the lowest paid positions. If you add this all up it doesn’t make any sense. It’s not a good deal for anyone. AE: It’s crazy to me how the U.S. Embassy in Kabul, The World Bank, and UNESCO aren’t giving this issue more attention. They even declined to be interviewed for your film, and I wonder why that is. Brent: The U.S. Embassy was one of the biggest sources of problems for this film, surprisingly. They have staff members that were doing good work. They actually have archaeologists on staff there and [the U.S. Embassy] wouldn’t allow any of those people to talk to me. AE: Wow. You couldn’t talk to them on the record at all? Brent: Not even off the record, they wouldn’t let me talk to them. I can only speculate, but I think the U.S. Embassy’s thinking was that ‘we want out of this country and we’ve made a huge mess here and we’re ready to just pass this problem on to China.’ I do think The World Bank and U.S. Embassy saw this Chinese investment as something positive at first. But I don’t know how they could think that now after what’s transpired and what we know about how Chinese companies operate in other third-world countries. But yeah, it was a big surprise how The U.S. Embassy wouldn’t talk to me. And they kind of blacklisted me and spread the word not to talk to me to other people. It’s still been really difficult. 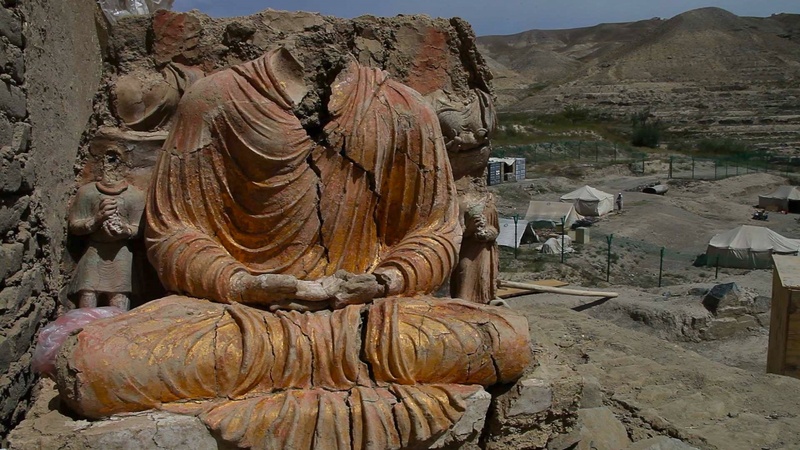 One of the main issues here is that MCC, this Chinese company, is government owned and I think so many companies get funding from China so nobody wants to say don’t destroy Mes Aynak because they don’t want to seem like they’re criticizing the Chinese government. AE: How does UNESCO play into this? Brent: UNESCO is a little more complicated because they have to be invited by the government to get involved. And that’s never happened. 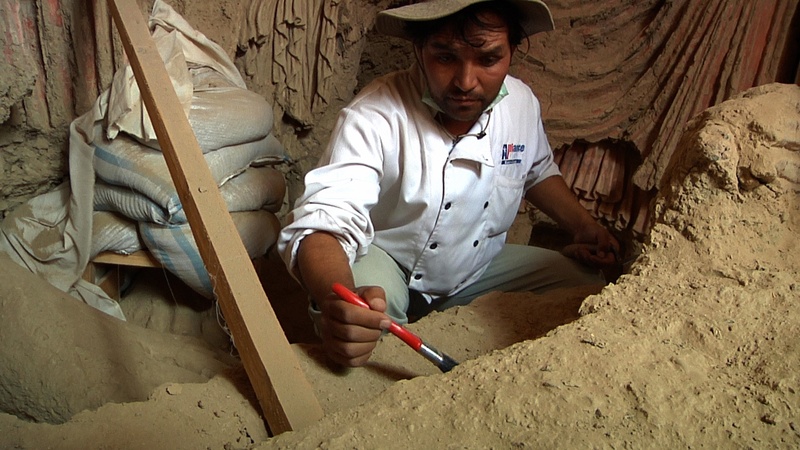 We’re actually launching an Indiegogo campaign later this month to raise awareness and convince the Afghan government to let UNESCO come in and organize the [excavation] process and push back against the company. [Mes Aynak] is really chaotic. People are constantly fighting with each other. Different groups are doing different things. They don’t communicate with each other. Funds are disappearing, and no one knows where this money is going. It’s a complicated situation that could benefit from UNESCO’s aid. AE: Given all of this chaos that was going on at the site and the unwillingness of the archaeologists from the U.S. Embassy to speak to you, what was your relationship like with Qadir Temori and the other archaeologists and trench workers at Mes Aynak? Brent: My relationship with the French archaeologists was pretty bad. They didn’t want to talk to me. They didn’t want to show me things. I would hear that they had access to things, and they just blew me off. But the Afghan archaeologists were always amazing. They were always super passionate, super open. They wanted to show me things and they were excited about showing me. They wanted this story to get out and they wanted me to spread the word about what they were doing and the amazing discoveries they were finding. My relationship with all the Afghans working there was great. It was perfect. Initially I thought if Mes Aynak, and this is still very possible, but if Mes Aynak was completely destroyed, the documentary, Saving Mes Aynak, is half documenting a visual record of the site and what was discovered, and also the stories of the archaeologists who really risked their lives to do this and preserve what they could. AE: I think that comes through in the film. One of the things I really appreciated was your focus on the individuals, which allowed for faces and stories to be placed in context with this cultural history that’s at stake. There are great smaller, personal moments that really emphasize the familial aspects of the film. Brent: Yeah, I hope so. I tried to make archaeology emotional and tug at your heart strings through Qadir, and these archaeologists who are doing this amazing work. AE: I’d imagine capturing all of these moments took quite a while. You mentioned before you started filming in 2011 but how many separate trips did you have to make to Afghanistan? Brent: Yeah, I’ve been filming since 2011, but I had to make six, three week trips or longer over the course of those years. I came in different seasons, but I was never actually allowed to stay at Mes Aynak. I’d have to get permission every time I went to the site. It entailed a ministry of culture permission, then Kabul police permission and then local province permission. Every time I visited the site I had to go through these three levels of permission and because the site was under such threat from the Taliban, I could only stay for four hours at a time before I had to leave. I’d get there and do as much as I could and before it got dark I’d have to get out of there just because the site was under such threat. AE: One of the archaeologists in the film said that each trip to Mes Aynak and back was like playing a game of Russian Roulette. Was your safety something that concerned you a lot during the filming? Brent: Definitely. That archaeologist accurately describes what Afghanistan feels like sometimes. If you get killed, you’re just in the wrong place at the wrong time. It does always feel sort of fifty-fifty. I made the film alone, so I was director, camera operator, sound, everything, and I was partnered with a translator. Basically me and this translator would travel to Mes Aynak in a rented taxi from Kabul, which seems crazy and stupid. (laughs) It would take an hour to get there and if somebody decided to shoot a rocket at the car or if we’d hit a landmine hidden under a rock in the road… I’d always feel this sigh of relief when I returned back to Kabul. AE: Despite that threat, would you go back to Mes Aynak, especially considering this story doesn’t have a definitive ending as of yet? Brent: As part of this upcoming Indiegogo campaign, I’m hoping to raise money to go back and show the film in Kabul. We have an official petition that we hope to give to the new president, Ashraf Ghani and I would love to visit the site. But like I said, I’ve made some enemies so it might be tricky to get back, but I’ll definitely try. AE: What are you hoping to achieve with the Indiegogo campaign and the trip back to Afghanistan? Brent: My goal is to completely stop mining and switch from this destructive rescue archaeology to total preservation. It’d be hard to imagine Mes Aynak becoming a tourist site anytime soon, but it’s not a completely foreign concept. The Buddha statues that you see getting blown up in the film, that site is actually a tourist destination and UNESCO has come in there and is in the process of building a tourist center, and even possibly rebuilding the statues. The concept is one that’s being explored in Afghanistan, in order to make these incredible archaeological site accessible to the public. That’s my ultimate goal with Mes Aynak. AE: Going back to this rescue archaeology, there’s a scene in the film where several archaeologists are arguing about using heavy machinery for excavating. I thought it was an interesting argument because on one hand I understand the desire to use manual labor and move slowly so as not to destroy any artifacts, but on the other hand, time is not on their side. As an observer, and someone passionate about this project, did you find yourself falling on either side of the argument? Brent: It’s tough. I think the use of that back hoe excavator bothered me in part because there are all kinds of tiny artifacts that could get destroyed. Who knows what’s under there. But also in that scene, one of the big things that’s happening is the Afghan archaeologists have no idea what the Ministry of Mine archaeologists are doing. I found that really disturbing that there was this complete breakdown of communication happening at the site. AE: Has anything changed at the site since the events of the film? Brent: Some things have gotten much worse. A few months ago, there were reports of looting happening at the site. One of the downsides of me making this film is I’m actually making Mes Aynak more famous. It’s a double-edged sword. The awareness campaign could possibly be driving a black market for these artifacts, which is extremely disturbing. The site needs to be protected. It needs more security. AE: Are people just sneaking onto the site and taking artifacts because of the lack of guards? Brent: Yeah, or people who work at the site are taking things. It’s rumors and accusations at this point, but part of the problem is that people aren’t paid a salary. When people have kids to feed, you can’t blame somebody if they pick something up and put it in their pocket to feed their family. There is some security, but they were never checking what’s in your bag when you’re leaving or what’s in your trunk. They were looking for weapons and bombs. There not only needs to be more security but they also need to check who’s coming in and who’s coming out. AE: You’ve probably heard about the recent destruction of the Mosul Museum in Iraq by ISIS. There have been a number of opinions on that travesty. But one of the most interesting that I’ve heard is that the artifacts and statues discovered in areas affected by ISIS or the Taliban should be placed in museums in other countries to prevent destruction and looting. What’s your take on that given these people risking their lives to uncover their history? Brent: (sighs) Boy, that’s a tough one. I don’t think they should be in this case, but it’s difficult to say that. The Kabul museum was actually blown up by the Taliban before, entirely blown up, and that’s where the Mes Aynak artifacts are going. So they’re going to this unsecure location, but my fear is that if [the artifacts] leave the country, they’ll leave the country for good. That’s a problem for Afghanistan, too, if these incredible artifacts are all somewhere else. Unless it’s temporary and the artifacts come back, I see a potential problem there. AE: With all this that you’ve shared with me, and the incredible story at the center of your film, I find it surprising how the media isn’t giving this more attention. Brent: I’ve tried to spread the word for years on CNN and The New York Times, and I’ve done a lot of work on a lot of the major news outlets, and still the story is not getting out for some reason. Post-recession Americans care about America. They don’t care about other countries unfortunately. Saving Mes Aynak as a film doesn’t have the male, American main character as the one who’s going to the site. It’s really Afghans telling the story and sadly I’ve felt that Americans are not that interested in what’s happening around the world. I do think people would pay attention if Mes Aynak was blown up and we saw the footage, I think Americans would be horrified. But at this stage, when help is really needed, it’s hard to get people to care. But that’s not the case in other countries. In Buddhist countries and in Thailand, people were protesting and marching. There’s bigger support around the world, but the U.S. is tricky. AE: I saw an article on your film which was headlined as “a real-life Indiana Jones fights to protect Afghanistan’s Buddhist heritage.” Like you were talking about it, seems to get Americans attention about issues, things have to be delivered in the form of the white, American male hero. Brent: (laughs) Exactly. It has to be spun as this adventure story. AE: Considering people’s knowledge and investment in the situation right now, how does the chance to save Mes Aynak look? Brent: Basically all the foreign archaeologists have left and funding has become a real problem so not much excavation is even happening. And the archaeologists don’t know when MCC is going to get started. They could start at any time, but I’ve been told it would happen at the end of this year, so we’ve really been pushing to get the film seen. The film will premiere on Al Jazerra America on July 5th. We’ve really been ramping up our efforts to spread the word and push back against MCC. Brent E. Huffman is an award-wining director, cinematographer, and producer whose work through German Camera Productions has covered social and environmental issues in Asia, Africa, and the Middle-East. He is also an assistant professor at Medill School of Journalism at Northwestern University where he teaches documentary filmmaking and theory. Saving Mes Aynak will premiere on Al Jazerra America on July 5th. Prioritize the film’s distribution by requesting a screening here. You can spread the word and push back against MCC by signing the petition to save Mes Aynak here and help to fund this project here. All images courtesy of Brent E. Huffman.